It was about thirty years ago that my parents, my grandparents, my brother and I went to the Ozarks in Missouri. It was our first long vacation with my paternal grandparents. The guys rode in the front seat with Dad driving. That left three the girls in the back. We left Nebraska early one morning and managed to get most of the way across Kansas by evening. Kansas was what prompted Grandma and Grandpa to get into an argument. Grandpa was always watching the weather and worrying about the early summer storms. He called them cyclones and Grandma, in the back seat, would nudge him on the shoulder and correct him by saying they were tornadoes. The comparisons and conversation would carry on for many miles with each trying to get the last work. Of course, once we started laughing, the conversation picked up in intensity. Fortunately we never saw a tornado or a cyclone. Memories were made in the Ozarks, particularly at Branson, Missouri. We went to shows and water slides, amusement parks and lakes. It was the same every year, but with Grandma and Grandpa it was special. Once we were there they stopped talking about cyclones and tornadoes as the entertainment was better. I can remember the trip back. We didn't go near Kansas for the fear we would travel the width of the state with cyclones and tornadoes discussed heatedly. Instead we drove north to Harrison County, Missouri. Mom, being the genealogist in the family, decided we should go to the Foster Cemetery and locate the graves on ancestors. Grandpa became emotional when we found his great, great grandmother's tombstone. 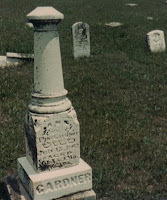 She was Anna Wells Gardner, born 1816 in Kentucky and died in 1882. Mom told us the story of how she became a widow at age 22 when pregnant with Grandpa's great grandfather. Anna took her young children to Iowa and then eventually to Harrison County. I am glad we encountered tombstones of relatives instead of tornadoes or even cyclones. Those trips which would continue to Missouri and also to Colorado were great memory makers in my growing up years.